Convert any Video File to sequence of Image Files with Video to Image Converter on your Mac running 10.7 or later (including Mac OS X 10.8, OS X Mavericks (version 10.9), OS X Yosemite 10.10, OS X El Capitan 10.11, macOS Sierra 10.12, macOS High Sierra 10.13 and for macOS Mojave 10.14. This Free to try Image Converter for Mac allows you to select Image File Format for Video to Image Conversion. You can also select almost any Video File on your Macintosh to be converted to Image Files. 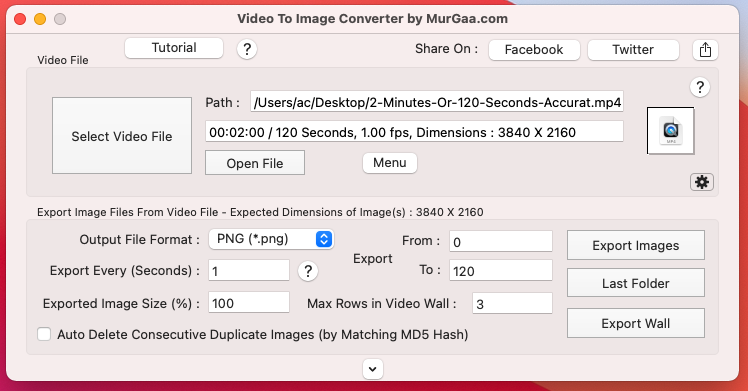 Yes you can define the time duration (in seconds) after which an Image File from the Video must be generated by doing Video to Image Conversion. Download and try out this Video to Image Converter Application on your Mac OS X to convert a Video File to Image or Picture Files. Video to Image Converter for Mac is supported for Mac OS X 10.7, 10.8, 10.9, 10.10, 10.11 (OS X El Capitan), 10.12 (macOS Sierra), 10.13 (macOS High Sierra) and for macOS Mojave 10.14. The Free Trial Download has a Usage Limitation and adds an extra Watermark to the Image Files created by Video to Image Conversion. This Video Conversion Utility for Macintosh allows you to convert any selected Video file to Images in various file formats. You can opt to convert Video File to Images in either BMP (*.bmp), JPG (*.jpg), PNG (*.png), GIF (*.gif) or even TIFF (*.tiff) file formats. Apart from Video to Image File conversion you can also change dimensions of the picture or image files created by this Video Converter Utility. Various Video File Formats are supported such as MOV Files, MP4 Files, etc for Video to Image Conversion. This Software is provided on a Free to try basis and the one time registration fee of only $6.99 which can be paid using Credit or Debit Card or even by PayPal Account. The Software does not requires any installation and is ready to use after download. You can also watch a video tutorial of the Video to Image Conversion and learn how easy and quick is to convert Video to Image or Picture Files. This Video to Image Conversion Utility for Mac is supported on Mac OS X Lion (10.7) and later versions of Apple's Macintosh Operating System. Do Contact Us in case you feel that another feature must be there in this Video to Image Converter for Mac and we will try our best to accomodate your feature request in next version of this Mac Utility. Please do send us an Email at Support@ChitPit.com and we will respond to your query as soon as possible.